Have I said lately how much I love making stuff? I love taking a random pile of stuff and turning it into something that didn’t exist until I made it. Pretty cool. Today I made diy wind chimes out of tiny clay pots. And of course, they are my new favorite thing ever. Cute, right? You can make diy wind chimes, too! Step 1 – Paint your pots. Don’t feel bad if you thought you would have to buy five different blue paints in order to make ombre paints. I totally did too. Then I remembered, kindergarten art! You can mix colors together! And all you need to make a bunch of different blues is one blue and some white. I would recommend creating each shade of blue separately. The first pot in your wind chime will be the fully saturated color you chose, no white added. For the second pot. Squirt out some blue and add a few drops of white and mix together until you have a less saturated blue than the previous. And so on. I chose to start with a fresh spot of blue each time because I wanted to be able to dip back in to the paint if I needed to do touch ups. The other option is to use one large amount of blue paint and just keep adding white to it as you go. If you do that, you can’t really go back from the last and lightest pot and touch up the third pot that is a bit darker. The acrylic paint does give nice coverage in one coat. PS – A pizza box makes a great mixing surface. Just don’t use the greasy side. 2. Once your pots are painted, let them dry OVERNIGHT! 3. When the pots are dry, you are ready to start stringing them up. I used twine to string my pots together. Basically, I stuck the twine into the hole of the darkest pot first and tied a knot at the top that would serve as the hanger. Then, I made a chunky knot that would secure the pot to it’s spot on the twine. The knot needs to be big enough to not fit through the hole in the pot. Or your pot will slip down the twine and you will be sad. Just below the knot, you’re going to tie on a washer. You want to place the washer close enough to the knot so that you can’t see it when it is hanging, but not so close that it doesn’t have room to bang around when the wind blows. This part takes some trial and error, but the twine is pretty forgiving and you can sort of force it up and down a little even after you’ve made the knots. Or you can always untie the knots. I found myself doing both of those things as I made my way down the twine with each pot. It takes a little patience to get things evenly spaced. I made sure to eyeball the placement as I went by holding up the wind chimes by the hanger and seeing if my placement was off. You could probably get all mathy and use some type of ruler or protractor, but you know I’m more of an eyeball-er. 4. Repeat the knotting and attaching the washers for each pot and then tie your large bead or crystal to the end. This last piece, either bead or crystal, should be a little heavy so that the wind will catch it and give the chimes a shake! And that is it! 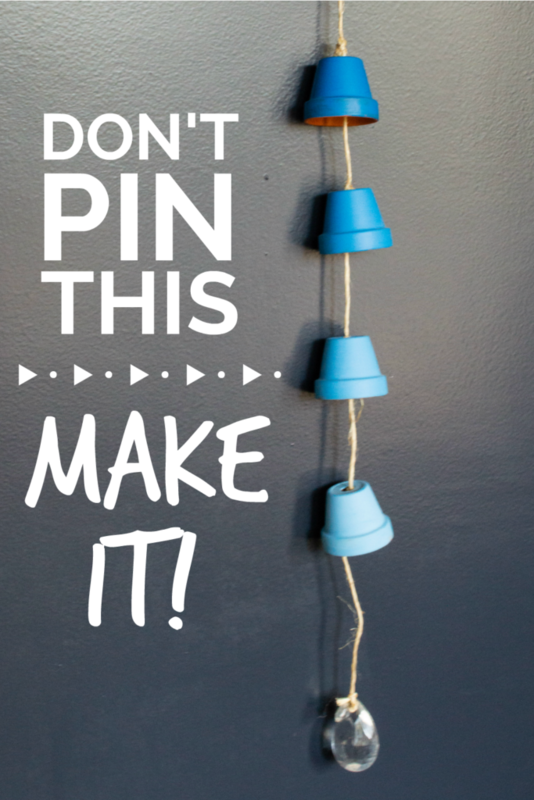 Four steps, cheap pretty diy wind chimes! This isn’t the only set of wind chimes I’ve made! Check these DIY Handpainted Wind Chimes out!